In Rithet's Bog, one of our favourite places to walk, the colour is fading. The brilliant yellow, gold, and red leaves fall to the ground and become dull. Soon grey and brown will dominate the landscape in austere architecture. Red-winged blackbirds alight onto exploded rushes that sway back and forth. Rain fills the bog once again and the ducks return, swimming placidly among the weeds. A few wigeon pairs have appeared amongst the mallards. They all seem to get along well. An awkward skein of ducks alight on a sunny day. They circle, then land, forward thrusting feet acting as brakes on the water. A family walk around the bog yesterday. The three-year old perches on Grandpa's shoulders. Two paths intersect and the train-loving boy calls out, "Junction!" The girl cousins run ahead for a bit, then fall behind and run to catch up, legs pedalling like windmills. They pick "woodland bouquets" along the path for their mothers. By the end of the walk, I'm certain that the children have covered twice the distance of the adults. They finish up with a train formed by holding hands: smallest to biggest, with Grandpa included. It was good that we walked yesterday. Today the rain fell off and on most of the afternoon. It was a good day to stay indoors. I read and puttered and took a nap. Tomorrow is a statutory holiday here, in lieu of Remembrance Day falling on a Saturday. Dear Lorrie, what a wonderful walk with all the family hand in hand. Great shots of the ducks,you did well to get so close. Hope the weather improves and you have a beautiful autumn week. Our Autumn colours seem to be at a similar stage - time to make the most of these last days before the final drop. Nothing better than spending family time together, walking, playing, having fun, and enjoying each others company. Autumn colours are showing here now, a little later than yours perhaps. Lovely photos. Happy family times! Love the blackbirds image. Birds are no doubt keenly searching for seeds as winter approaches. What a joy to see your mosaic with your family. A family walk is always fun. The young girls look so happy. My surroundings are gradually changing to autumn colors too. Happy day to you all. I'm walking on the dyke this morning. The red-winged blackbirds love it there. We're definitely losing the colours now. It's lovely that your family was able to get together for a walk. What a lovely place to walk. We still have a few russet colored leaves clinging to the trees, but they will fall soon. Beautiful Autumn color. I haven't seen a red-winged blackbird for many years. I love walking and what a lovely family! Have a great week. Sweet pictures of your family on that gorgeous walk! It always feels good to get out for a walk without a rainshower. Today we have high winds with the electricity flickering. Glad you get a day off today! What a wonderful Autumn walk. I am also noticing the colors are fading and disappearing. Time to bring sparkles and candles out in the house to help with the dreary days. Your family walk sounds like fun...we took the grandchildren to the IMax yesterday to see Animal Kingdom. The Fall colours are fading...we saw Trumpeter Swans out along the Galloping Goose near Lochside today...the rainy weather and wind made it almost impossible to walk...we've lit a fire now and are toasty. Lorrie, what sweet family pictures! And I love all the different ducks. Your post has me feeling ducky! Lorrie - your vivid descriptions - clever turns of phrase - my imagination transported me there. And so glad to see everyone wearing poppies for remembrance - this tradition is starting to catch on in the US as well. Have a snug week. Nice looking birds all around. I love the photos of the ducks, they are so sweet. And I like the blackbirds as well, they always remind of that Agatha Christie book where they come out of a pie, can't remember why. How beautiful. What a wonder full day for your family. These are the kind of days that I prefer. To be outdoors and with our loves. Thank you so much for your visit to my blog. I hope to return to blogging in the new year. I have missed it. Sweet November says to you Lorrie. I love your description of the family walk! It can seem so normal ... but it's a normal that will not stay, so it's special how you notice it's sweetness. Oh the cousins are so darling together! Loved your words...they draw me in...and the grandboy calling out “junction” made me chuckle with joy. It is good to write these things down! 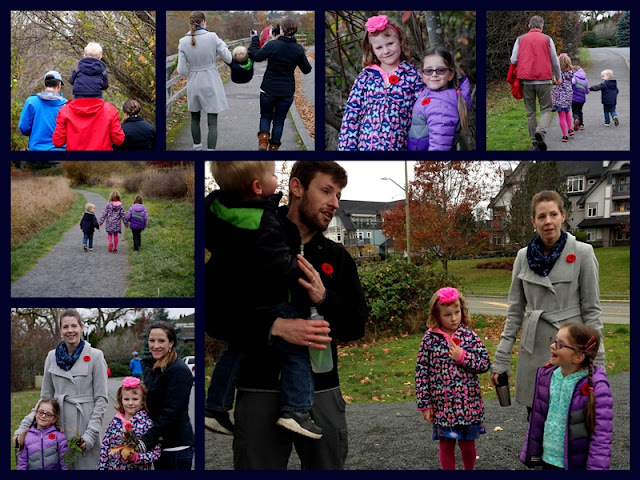 What fun to be able to walk with your family in the most delightful of spots on a cool fall evening. The delights of the birds and the animals around you as well as all the beautiful colors of fall were shared with delightful description. The weather has turned rainy here as well, such are the dreary days of November! Such fun to be together on a family outing, Lorrie! Of course, your pics always amaze me, as you capture such beauty out and about.